Rates of ADHD have soared in recent decades, with research thus far yielding no explanation One possible contributing factor, thought Bhide, is that the current spike in ADHD cases correlates in some manner to an increase in the number of women who smoked during pregnancy as cigarettes became fashionable in the United States around the time of World War II and in the decades that followed. Maternal smoking affects three generations simultaneously. What made you want to investigate the multigenerational effects of nicotine exposure? My colleagues at Florida State University, Tallahassee and Massachusetts General Hospital in Boston and I have been studying the neurobiology of ADHD using a mouse model for a number of years. There have been a number of reports, including our own, which show that prenatal nicotine exposure (cigarette smoking during pregnancy) increases the risk of ADHD in the offspring significantly. Therefore, we developed a mouse model of prenatal nicotine exposure to study the neurobiological mechanisms contributing to an ADHD-like phenotype in the offspring. In the course of this work, we came across reports in the scientific literature, which suggested that the effects of environmental factors, mostly harmful factors such as drugs, stress, starvation etc, might be transmitted from the exposed generation to multiple subsequent generations even though only the founders were directly exposed to a specific environmental factor. Therefore, we suspected that nicotine also could be an environmental factor, which could produce multi-generational effects. Can you summarize the findings of your recent study? We found that mice exposed to nicotine prenatally (in utero) exhibited hyperactivity, a proxy for human ADHD-like phenotype, as adults, and that the hyperactivity is transmitted by these prenatally nicotine exposed offspring to two subsequent generations, even though neither generation was directly exposed to nicotine. Moreover, the multi-generational transmission of hyperactivity occurred via the female or maternal line and not the male or paternal line of descent. In terms of potential impacts on the genome and epigenome, what are the various chemicals of concern in cigarette smoke, aside from nicotine? Is cigarette smoke considered an endocrine disruptor or a mutagen? Over 1,000 harmful products are contained in cigarette smoke, apart from nicotine. 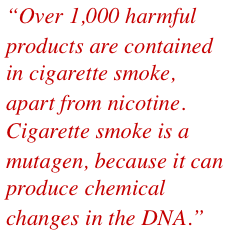 Cigarette smoke is a mutagen, because it can produce chemical changes in the DNA. It is important to note that in our mouse model we used nicotine and not cigarette smoke as the teratogen. You mouse model found hyperactivity in grandpups of the exposed females, but not the exposed males. Can you speculate about why that may be? This is a question that we are now investigating, and it is too early to speculate. However, it is important to note that exposure of the male mice to nicotine (instead of the pregnant females, as in the present study) could produce hyperactivity in the offspring, which could be transmitted from generation to generation. We are now performing experiments to address this question. Mechanistically, how did nicotine affect the developing fetal germline? Exposure of the germline to nicotine produces epigenetic changes in the germline. Some of these changes are likely not beneficial to the offspring, they are permanent, and passed from one generation to the next. Smoking during pregnancy was very common in the 1950s, 60s and 70s, and the autism and ADHD explosions began in the 1980s; do you think there could be a germline effect at work here? Yes. It is a possibility. Additional evidence is needed to support it. Aside from maternal smoking, what other pregnancy exposures might be of concern? Any classes of drugs, pharmaceuticals or chemicals that raise questions? I would include in this category psychostimulants (cocaine, methylphenidate, amphetamine), opioids, cannabinoids, hormones etc. One hopes that the beneficial effects of nutrition and a nurturing social and intellectual environment are also transmitted from one generation to the next. So, it is not all negative! Do you think that autism risk genes, those genes involved in neurodevelopment, may be particularly vulnerable to perturbation by certain exposures? This is an important point. Each gene shows varying degrees of vulnerability to a given factor. Therefore, a detailed and careful analysis of this issue could prove immensely helpful. What are the three most important areas for autism causation research in the next few years, in your opinion? When a pregnant woman smokes, she is usually warned about potential damage to her fetus, but so far no effort has been made to warn of potential damage to the fetal germ cells, and thus the future grandchildren. Should this policy change? Yes. It should change. However, it is important to note that fathers should also exercise vigilance. 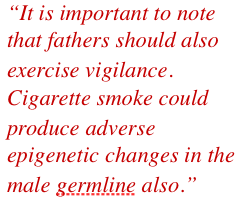 Cigarette smoke could produce adverse epigenetic changes in the male germline also, and fathers could pass these harmful changes to their grand- and great-grandchildren. We tend to target mothers and not fathers. The warnings about cigarettes or other harmful drugs should apply to both men and women.